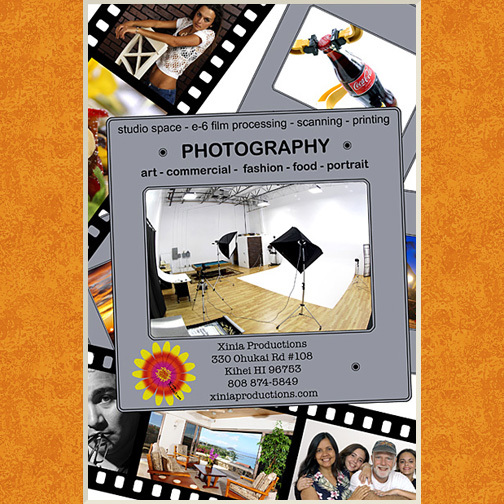 Aloha and welcome to Xinia Productions, the photography studio and lab in Kihei, Maui. In the studio I shoot art, commercial, fashion, fx, glamour, portrait and studio photography. I also shoot food and sports on location. I use both film and digital cameras ranging from a Nikon D700 to to a Horseman 8x10 camera. I process all my digital shoots and scan all my film here in Kihei. I also scan and print for other photographers and artist here on Maui. I now send out all e-6 slide film for processing. I was the last company in Hawaii that ran e-6 film.